Adventures in the Endless Pursuit of Entertainment: Is there some reason why you haven't seen Mary Stuart? Is there some reason why you haven't seen Mary Stuart? 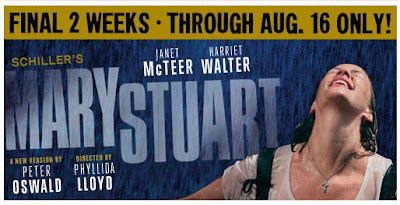 There are ONLY EIGHTEEN performances left of Mary Stuart at the Broadhurst Theatre. The Tony nominated performances by Harriet Walter as Queen Elizabeth I and Janet McTeer as Mary, Queen of Scots, are two of the most beautiful, most compelling, most powerful ever to be seen. Discount tickets are available from broadwaybox.com or for 1/2 price the same day as the performance at the TKTS booth. As for me, I'm going for my third visit tomorrow night. Believe me, if I were there, I would see it! I love Janet McTeer. If I could get there I would. Harriet Walter is one of my acting idols, but alas I am on the wrong coast.